Expand the aluminum welding capabilities of your Prince® XL, Python® & Python® LX welding guns with the addition of a Curved Gas Cup and Contact Tips. Made to fit all current production Straight, Air/Water and Air Cooled barrels for the Prince® XL, Python® & Python® LX welding guns. The simple, curved design of these tips establishes a more positive electrical contact with the welding wire; enhancing arc strikes and arc characteristics. 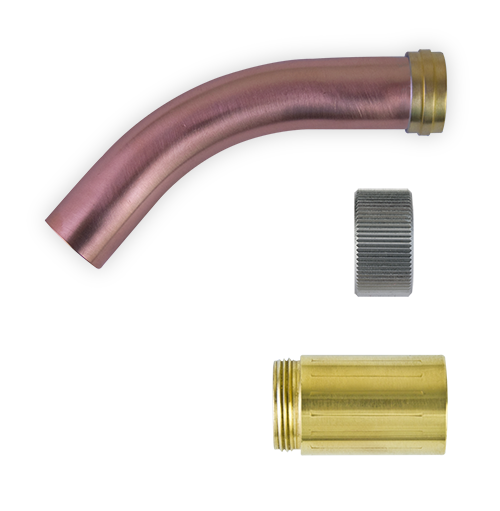 The narrow profile of the Curved Gas Cup (3/4” outside diameter) enables the operator to reach in and weld in very tight spaces, seams or gaps. To adapt the curved front-end assembly to your straight barrel, choose from the part numbers shown below.